COMMENTS: I used this mold to make a few melt & pour soaps with my 6-year old granddaughter and it worked great. It was very easy to use and she was able to get the soaps to release and come out of the mold w/o any help from me. She was so delighted when they came out of the mold so easily (with a little verbal instruction from Nana) that she considered them "hers"! I love these Milky Way molds! 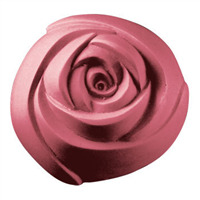 COMMENTS: Rose is one of our largest sellers in our company and this mold is beautiful. Just large enough to not feel to bulky and still have the pronounced Rose outline. COMMENTS: This mold is pretty!! It also makes big shavy. 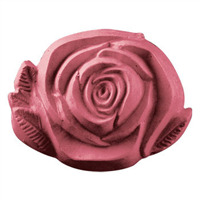 "Bas Relief Rose Soap Mold (MW 183)"
COMMENTS: Used this to make White Gardenia soap, it was a hit. Thank you for these amazing molds. They hold up to repeated use and clean up easily with warm water. COMMENTS: Made a lovely bar of MP soap & fizzies! Wished I had ordered more than one, what was I thinking. It released nicely and was soooo pretty! COMMENTS: Used these for an Adult Bath Fizz, they came out beautiful, like this mold, makes an impressive product. 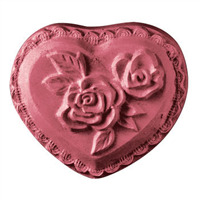 COMMENTS: I bought this mold to make a ladies shaving soap. I used a Honeysuckle & Neroli mix and did an in the pot swirl with pink and purple. It sold out at the craft fair. I kept a bar for myself to try. I like how the design is helpful in building the lather on top of the soap. it is a good size. "Beautiful mold, can be used for CP soap?" Staff Answer Yes, this mold can be used for CP soap. We give specific directions for use with CP soap under the "Directions & Ingredients" tab for this product.